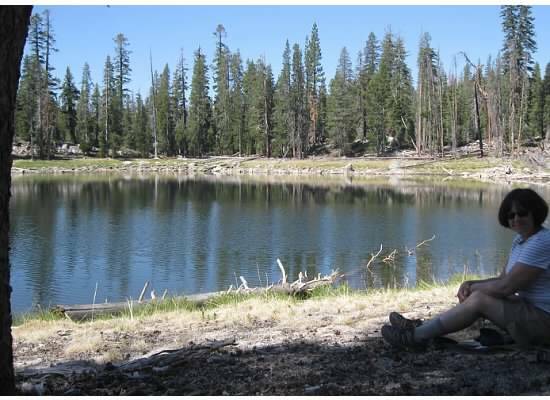 The walk to Harden Lake in Yosemite National Park began at White Wolf Lodge. Rangers in crisp uniforms were just arriving on shift. People milled about. Children stood in line to make purchases from the tiny closet-sized store. A man sat on his porch observing the goings-on around him. I left the activity and passed through a gate at the end of the paved road. 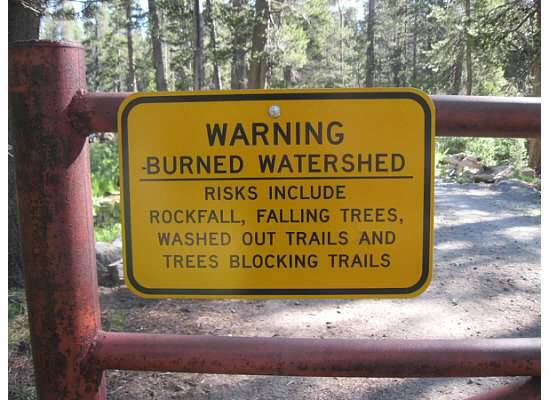 A sign on the gate was a reminder of the 2013 Rim Fire, the third largest fire in California history. Although the route I walked was not affected by that fire, a bit farther west of the lake was. 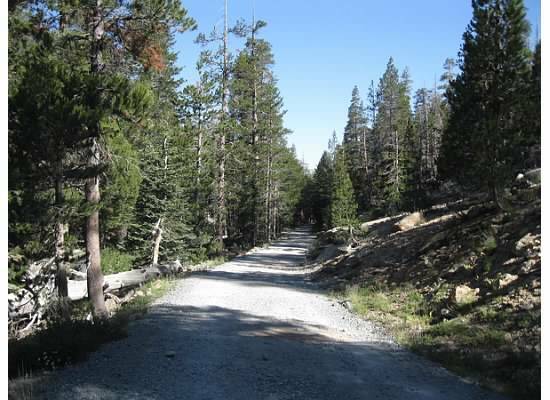 The trail to Harden Lake began on the Great Sierra Wagon Road more commonly known as Old Tioga Road. 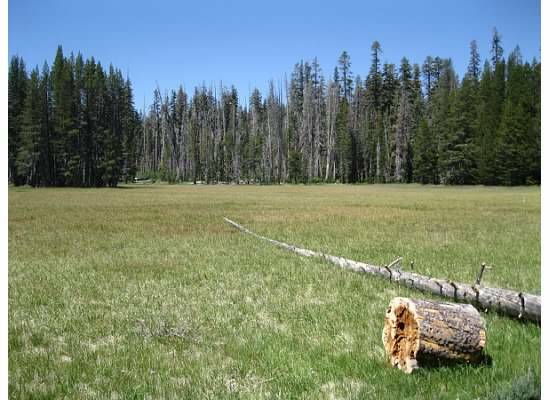 The wide, rubbly path ran parallel to the trickling Middle Tuolumne River and led gently downhill. This historic road was constructed in 1882 by the Great Sierra Silver Mining Company to transport mining supplies to the mine at Tioga Hill. Wildflowers lined the trail from start to finish. I’ve photographed most of them on other trails, so this time I counted them. 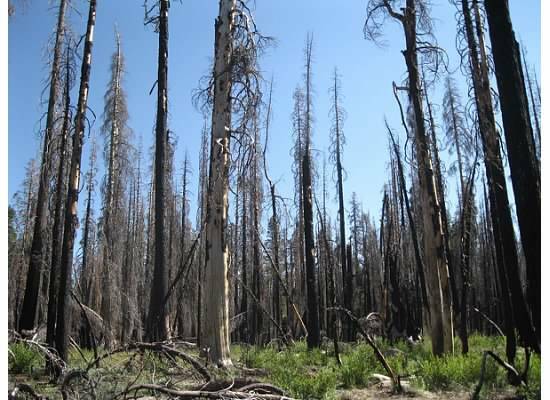 Part way in, a spur trail veered away from the river and led through the burned forest then rejoined the main road. Much of this area burned in the 2002 Wolf Fire. Along the way, giant cow parsnips grew as tall as me; and a large area of Bigelow’s sneezeweed brightened a meadow. 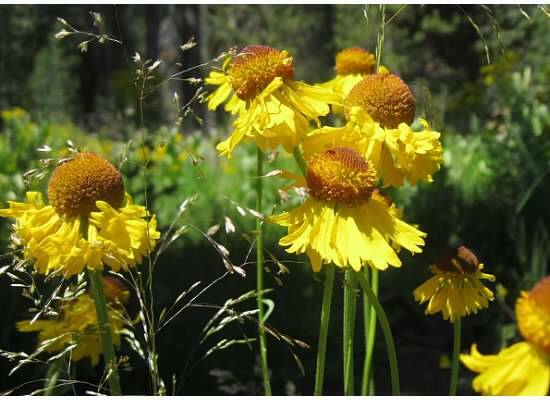 Sneezeweed are fun flowers to find. There were thimbleberries and wild strawberries, both void of fruit. The pussypaws that grew in the sun were the largest that I’ve seen. 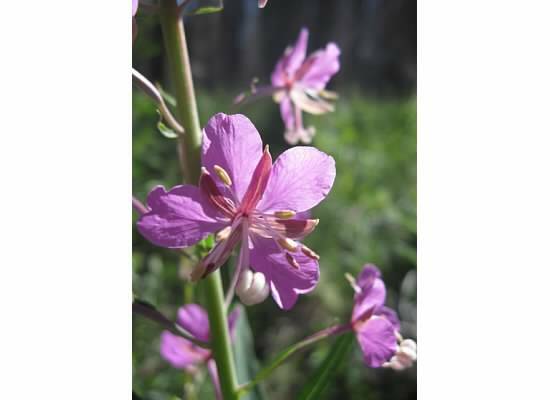 I found fireweed, an interesting flower that grows only after fire has destroyed the ground cover. In all, I counted 21 types of wildflowers, but there were more that I didn’t recognize. Fireweed—first time seeing this flower. The trail led through an aspen grove where I counted 44 saplings, their leaves quivering in the wind (no good photos). 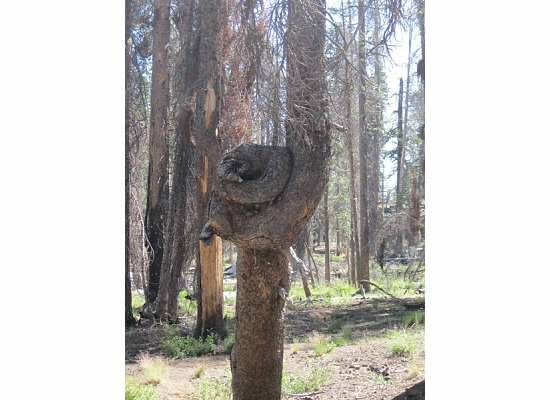 Again, fire benefits these trees by opening up the landscape and allowing the sun to help them flourish. Here, I passed a single day-hiker and four backpackers heading towards White Wolf. 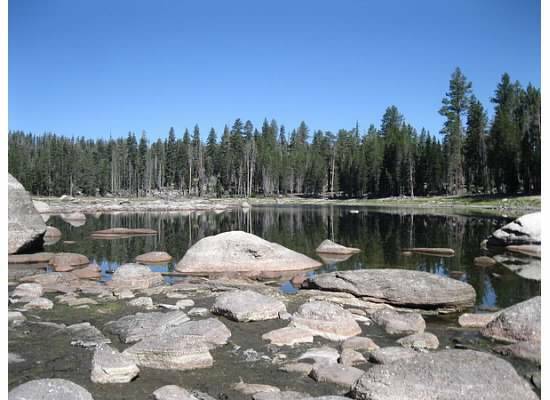 After a short while I came upon the boulder-strewn side of Harden Lake. The closer I got to the lake, the muddier the area became. Stopping to look around, I saw a woman sitting nearby. There was no official trail around the lake, so I rock hopped to keep out of the mud and tried not to step on the tiny flowers growing in the sludge. Up the bank abutting the trees was a shady spot. I sat and listened to the wind blowing through the trees on the opposite shore before feeling its refreshing breeze. Across the lake the woman got up and left. I had the place to myself! I heard the caw of birds and counted one…two…three crows fly overhead. They proved not to be crows but big, sooty ravens raising a ruckus with each other. They flew across the lake, into the trees and back, croaking the whole way; and then they vanished. It was quiet again. 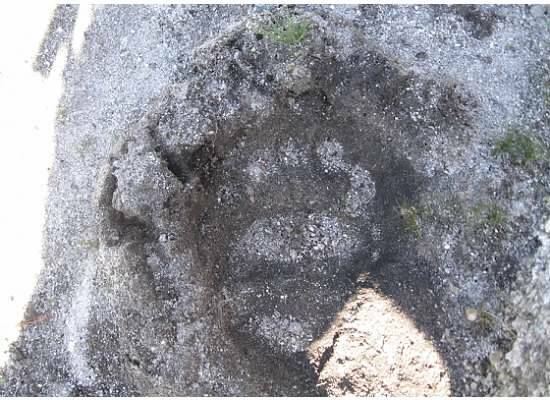 A bear print sunk deeply in the mud. A splash in the water like someone doing a belly flop startled me. I scanned the lake concerned that it was a bear since I saw big paw prints on the shore. Alas, I smiled to myself when I realized it was a dozen well-camouflaged ducklings and their parents entering the water. A loud quack was emitted from one in the bunch and then it was quiet again. The sandy area where I sat was comfortable. I ate an early lunch then read a chapter in the book I brought. An enthusiastic “Whoo-hoo!” echoed across the water when two people approached the rocky side of the lake. By that time my shady spot had turned into the sunny side of the beach, it was time to leave. Continuing around the lake away from the couple, I negotiated a route through the mud. I climbed over large rocks and many fallen trees with jagged branches until I saw a faint path. The path led over a hill and I followed, pleased to see an expansive meadow open up before me. Here is where I found the three ravens walking quietly through the grass. The narrow trail skirted the meadow and when I looked up, I saw a deer. I wondered if she was eating the bracken ferns that grew in colonies throughout the forested area. I saw one deer, three skittish chickarees and a kaleidoscope of butterflies. After a five-minute walk, I hooked up with the trail I came in on. Seven more people passed heading towards the lake. July is the second busiest month for the park when over half a million people visit. As I re-entered the busy campground I realized how fortunate I was to have spent a quiet morning alone at the lake. 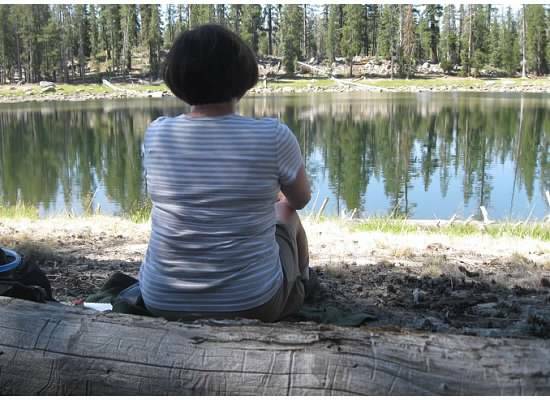 It never ceases to amaze me that in the middle of summer I can find solitude in Yosemite. 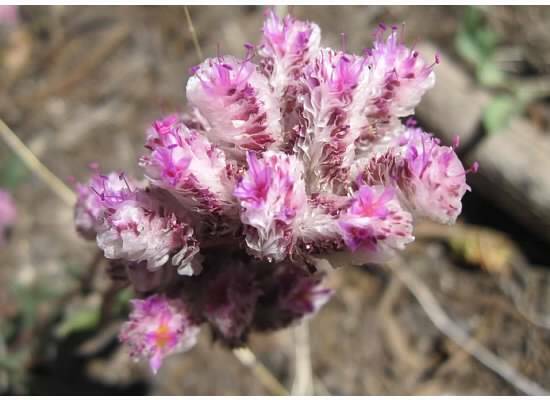 This entry was posted in Yosemite Hikes and tagged Great Sierra Wagon Road, Harden Lake, Old Tioga Road, Wildflowers, Yosemite, Yosemite National Park on July 12, 2014 by Janet. It always amazes me that with as many hikes as you’ve taken you continue to observer so many new places, flowers and interesting sights. Obviously, I found the part about the ravens particularly interesting … deus pascit corvos. Lots of places to explore. I think the ravens are smart birds, supposedly the most intelligent of birds. The pussypaws are beautiful! I’ve never seen that type of wildflower before. They usually grow close to the ground and sometimes you only see a faint pink color. These were bigger. 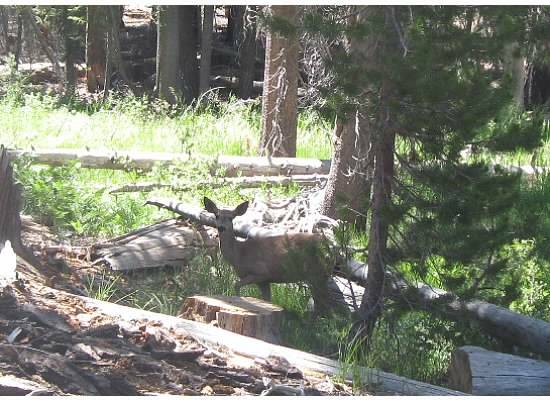 I love tagging along on your walks–thanks for showing me another quiet beautiful place in Yosemite! Wish you were there to share it with me. Janet, I had no idea you had thimbleberries out your way. As for crows, we’ve been hearing them make a racket lately. (Or maybe ravens?) They have been carrying on so mightily we sometimes fear for our sanity. Wondering if there are baby crows making that racket from their nest? Thank you. 🙂 You should come out here to decide for yourself which is prettiest. What an awesome experience! It’s easy (at least for me) to get caught up in the busy Yosemite summer and overlook the magical solitude you can find if you go out exploring at the right hours.Thank you so much for sharing! Wow, Janet, you have such interesting tales!!!! I felt like I was there with you! Thanks, makes “home” a little closer! Thanks, Marlene. Looking forward to when you return.